Sometimes I feel like there is just TOO MUCH PAPER coming into my house! Every time I turn around there’s some new piece of paper needing attention. Whether it’s mail, kid’s papers, bills, receipts, flyers, whatever, somehow it always winds up on my kitchen counter top. Here’s a roundup of seven systems to organize paper clutter from a few awesome bloggers that you can try. **This post may contain affiliate links, which means we may receive a small commission, at no cost to you, if you make a purchase through a link. * For the full disclosure and privacy statement click here. Check out this post by Ask Anna Moseley where she lists nine rules for organizing paper clutter. Her method promises to organize all the paper cluttering up your house in about 30 minutes. I love how she color coordinates all of her files. It makes opening up a file drawer of bills and receipts, dare I say, fun. This post over at Home Storage Solutions uses a weekly paperwork session. This helps you avoid accumulating paper clutter in the first place. This weekly paperwork session is part of a larger 52 week organizing system that she developed. The Sunday Basket is a weekly paper organizing system developed by professional organizer Lisa Woodruff. This is another organizing system that requires a weekly commitment but the way she’s organized her Sunday basket is really cute and functional. If you don’t have an official “office” try making this mobile command center posted by A Bowl Full of Lemons. I like how neat and compact this system is. It also has room for every person in the family to have their own folder. That way everyone can manage their own papers. I’m becoming a serious binder lover so this post to organize paper clutter is right up my alley. I love how neat and tidy everything looks while still being totally accessible. Deciding which papers and projects your kids bring home from school can be a challenge. This post helps you decide which papers to keep and how to organize them once you’ve got them. Plus – binders! Check out this multi-section inbox. 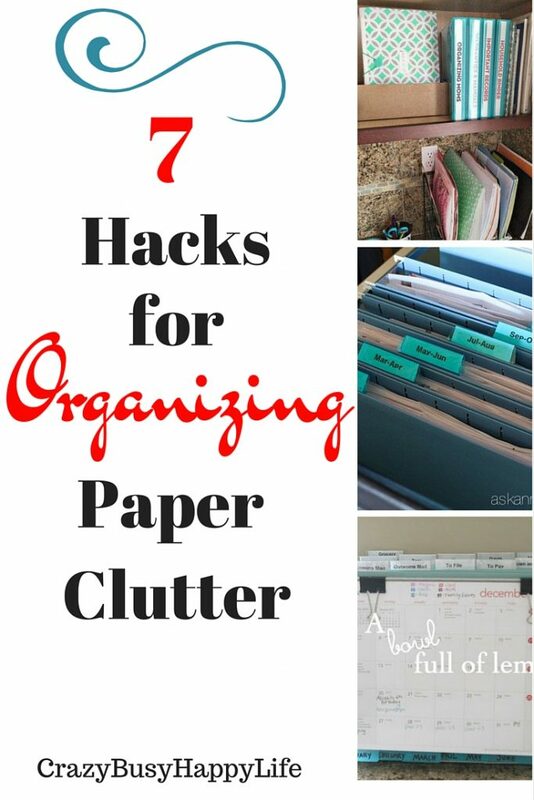 Such a great idea to organize paper clutter! This is a great way to get rid of a big pile of papers quick! Plus I like how this system doesn’t take up any precious desk space. Gotta be clear for those flat lays yo! OK. Now I’m seriously motivated to organize my paper clutter. Do you have any great paper organization systems? I’d love to hear about them. Enter your email and download my planner worksheet for free. This will also subscribe you to my newsletter so that you can stay up-to-date on all of my helpful tips! Thanks for linking to my Sunday Basket and School Paper Binders. As you can tell… I LOVE organizing paper! Hi! I'm Elizabeth. 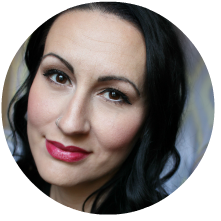 This blog is for busy women and warrior-moms. We all need a little help and inspiration to love the life we're living. Follow along for tips on productivity, earning extra income, and organization. Don't forget to sign up for updates delivered straight to your inbox. Crazy Busy Happy Life is a participant in the Amazon Services LLC Associates Program, an affiliate advertising program designed to provide a means for sites to earn advertising fees by advertising and linking to amazon.com. Please note that Crazy Busy Happy Life may have financial relationships with certain merchants linked and or mentioned in posts. While all attempts are made to present accurate information, it may not be appropriate for your specific circumstances and information may become outdated. Copyright © CrazyBusyHappyLife 2016. All Rights Reserved.